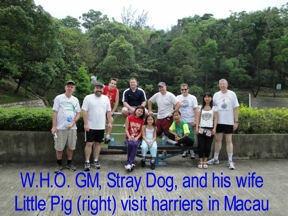 The World Harrier* Organization is a loose association of friendly groups or clubs who practice the sport of hare and hounds founded in 1995 by Larry "Stray Dog" McDowell. 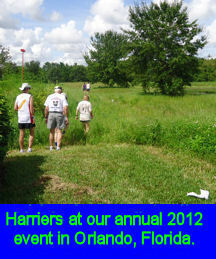 It all began as an association under the Global Trash banner, when the editor/publisher began registering harrier groups and gathering them for an annual event. He hosted the first annual world invitational event, Global Trash Hash (later called the World Interhash, Global Interhash and now Annual World Harrier Organization Trail and Banquet) starting in 1995. Also that year, he placed his hard copy directory of harrier groups on a website and began registering groups on-line from around the world. It was renamed the World Harrier Organization in 2015 to widen the scope or the types of harrier groups we include in our association. While some had created listings of harrier groups during that period, Stray Dog was careful to begin weeding those out that were more social drinking clubs and fraternities, than hare and hounds groups, and failed to maintain the friendly nature of the hare and hounds tradition he came up in from 1982. Members of this early association of harriers were friendly and loved the on-line and annual event association with others with a love of the traditional hare and hounds sport. Everyone who attended one of Stray Dog's events experienced the sport as it was intended - live hare trails, great beverages and food, fun social entertainment and activities, all for a lower fee than anywhere else - and friendly. In this sport, there are hare(s) (a runner or runners) who lay a trail (usually cross-country) with various trail marking materials (like the toilet paper used in the Orlando picture below). The hares are then followed a few minutes after leaving by the pack of hounds (other runners) whose eventual goal is to catch a hare before the trail is completed. It is quite fun, with the side effect that you may accidentally get into shape doing the sport. Some participants may run fast, others just jog and some groups permit walkers to negotiate the trail. They are loosely kept together in ability packs through the use of false trails and ingenious trail design (hopefully). Most all groups finish their runs with some social activity, refreshment and snacks or food. When you become a member, you can learn a lot more in great detail reading the World Harrier Organization Manual. If you are an experienced harrier, this is a more universal treatment of the sport than is usually expressed in other associations of hare and hounds, like the Hash House Harriers (HHH). We encourage all types of groups in our association as long as they are generally comfortable with our creed (read it in the left column). We do not, like the HHH, require any social liturgy (i.e. the Down Down) nor do we frown on hare and hounds groups who have a competitive nature. Traditionally, the sport was a competitive one. We accept friendly Hash House Harrier groups that have no problem with our creed (most groups I have seen) and most of those hare and hounds groups who would not fit into the HHH model. History: Since 1993, Global Trash has published a directory and information for hare and hounds groups around the world. Even before GT, the editor began a directory when he was German Nash OnSec with the German Nash Trash. This effort grew with his next periodical, EuroTrash, which eventually turned into the magazine you now know as Global Trash today. In July 1995 GT put up its first website and the directory was put on line in September that year. The oldest international hare and hounds publication, InterHashional News, provided a directory since 1984. GT provided data for IHN at the end of Mr. Spock's long editorship, eventually taking over publication, continuing to provide periodic directories. Now under the new World Harrier Organization, Global Publications and Software (GP&S), the umbrella publisher for all of this, continues to publish web and hardcopy directories for harriers. In 2001, GP&S began work on a large project to furnish harriers (hhhweb.com) and groups (Visual OnSec) a means to have their own websites. Visual OnSec began as a floppy disk and later CD-ROM program purchased by groups for their management software. It was moved slowly to the web in 2001. HHHWeb.com provided websites to members, later becoming WorldHashSpace.com. Both provided web pages, photo albums, journals and/or forums, and more. Visual On-Sec provided database support for rosters, calendars, hash cash and more to manage the groups. Despite repeated attacks by what I refer to as Hash Terrorists (their emails discussing the attacks were leaked by a friendly hacker), we continued to keep up these websites for many years. These disgruntled foes, acting in a fashion not as friendly harriers, were jealous of our efforts do compete in the harrier information field against their favorite websites – with us usually dominating the search engines. However, our security dropped far behind the times and eventually these sites were wiped out by these pretend harriers with attitude problems on a couple of occasions. After the last major attack, I shut everything down and spent three years of time studying and improving security, so that I could rebuild this effort. Read further how all these get integrated with the world directory. The Future - As you can see, the world directory is being revamped with a better look and security. We protected the data in the past and it was not taken in mass, as some hacks have done. However, the future security helps not only to protect the mass data, but to prevent it from being corrupted or destroyed. With our provider giving us a much higher level of security, the design making it much tougher to hurt us, and data backup more proactive, we are confident that we can persevere from now on. In the future, all personal and group websites will become member and group directory driven so that instead of signing up for a website, ALL members and groups will be provided with a basic website. What they do with the tools as they are developed to completion, is simply up to them. We hope to have the basics of all this completed by the end of August 2015, with features added constantly until the end of the year. If you had a previous HHHWeb.com, WorldHashSpace.com or Visual On-Sec account in the past, and your data can be rehabilitated from the attacks, I am working to set up your new sites with similar criteria as before. All your pictures from before should be available. I am shooting for the end of Summer 2015, though some features may take longer. Please keep coming back to our site, as we had the top Hash House Harriers website for two decades and our expansion to the entire hare and hounds world will make it even better.